(a) Schematical of the iconoscope, showing the disposal its structural elements. Basically the Iconoscope is an optical electrical device. (b) In this way, through an optical system the black and white image is focused on to a mica plate. One side of this plate has a mosaic of tiny globules of photosensitized material especially treated for high photoelectric emission. An electron gun and associated bean deflecting system are mounted in the neck of the Iconoscope. The electron beam is made to sweep regularly the mica plate in a zigzag pattern originating the process as known as scanning. (c) The scanning is started by the flow of current through the set of horizontal and vertical deflecting coils and in this way originating the variable raster. For instance, in the Brazilian television system, there are 625 lines in each picture, which is repeated 25 times per second. (b) Illustration of the iconoscope originally invented by Vladimir Kosma Zworykin. - The Vidicon, similar to the Orthicon, but in place of target plate coated with a photo emissive elements it was replaced by a thin film made with Antimony Sulphied, which becomes conductive under the influence of light. (c) Ilustração do processo de varredura da imagem em ziguezague. camera tube for operation at low light intensities for military applications purpose. The result was the Image Orthicon a, low inertia, and highly sensitive camera with good definition, circa 100 lux for studios takes. In this way it became the standard camera tube for black and white television either for studio as well as for reporting applications. In 1970, W.S Boyle and G.E. Smith working for Bell Laboratories, USA, developed a new type of semiconductor storage device, named CCD or charge-coupled device. (n) As an electrical optical device, the CCD has a principle basic completely different when compared with the aforementioned thermionic television cameras using photosensitize material for the detection of electrons. In the CCD cameras, the electron detection is made by storing the charges, which are proportionally absorbed in small wells or discret elements displayed on a CHIP, known as PIXELS, which is an acronym for PICTURE ELEMENT. Dr. V.K. 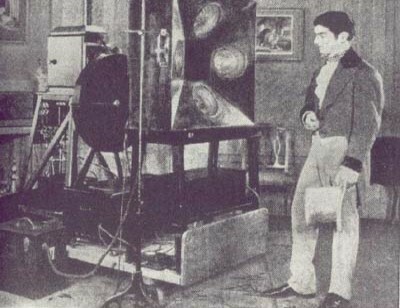 Zworykin, inventor of the iconoscope, shown with a new type of picture tube launched in the market by RCA circa 1945 under the tradename of "Image Orthicon". This new type of picutre tube was developed by Drs. Albert Rose, Paul K. Weimer and Harold B. Law of the RCA research staff originally based in the improved cathode-ray tube technology used for the manufacturing of RADAR, LORAN, SONAR and some typef of RADIO DIRECTION FINDERS during the WWII. (l) Antique type of television camera. (h) Diagram of the Image Orthicon.